No time like the present for technology trade-ins. It can seem logical to conduct your iPad refreshes during the summer months when teachers, staff and students are not present. IT then has all summer to wipe, sell, purchase and onboard their new technology. The problem with summer refreshes is that the buyback market is flooded with devices from schools doing the same thing. And when the supply is high — which is in the summer — the demand is less, meaning the trade-in value you’ll receive will be substantially lower than only a few months prior. 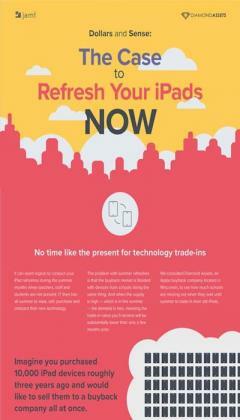 Download this infographic to see how much money schools leave on the table when they wait to trade in their technology.